This is a typical collection of various levels for Doom I & II, with new sounds and music, plus utilities for creating new missions. In over 300MB, play new wads (with walkthroughs in French). 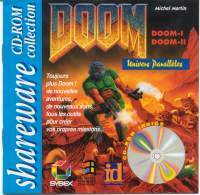 It contains shareware versions of Doom v1.2, 1.666, 1.8 plus patches, a utility for converting Doom 1 wads to Doom 2. It also contains shareware versions of Heretic, Depth Dwellers, Ken's Labyrinth and Corridor 7.